Kim Walsh-Childers believes accurate news coverage can be good for your health. Walsh-Childers has spent her career researching how the traditional media and the Internet contribute to individual health behaviors and public health policy. 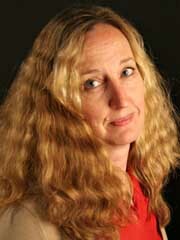 In 2004, she used her Fulbright Scholar Award to conduct research on health journalists in Ireland. While she was there, she focused on the effects of news coverage on Irish health policies. She’s working on her second paper on the subject. On this side of the Atlantic, Walsh-Childers recently joined forces with experts at Shands at UF to investigate how breast cancer is portrayed in magazines and on the Internet. Her study, which focuses specifically on popular women’s magazines, is funded by the National Institutes of Health. The study also includes Internet information. Using four search terms, Walsh-Childers tested the accuracy of media information on the Internet while comparing the content of online and magazine sources. To solidify her research, she collaborated with breast cancer experts from UF’s Shands Cancer Center to judge the media on their accuracy of 33 fundamental facts about breast cancer. Walsh-Childers was the first-ever recipient of the College of Journalism and Communications’ Faculty Summer Grant Development Award. She has used the award to propose more grants to NIH and the Lance Armstrong Foundation. She’s also received grants from the Robert Wood Johnson Foundation, which funded research on newspaper coverage of health policy, and the Kaiser Family Foundation, which has funded Walsh-Childers to study sexual content in consumer magazines. For her latest project, Walsh-Childers is departing from her typical research by studying the effects of tragic events on journalists and the people they interview. Her research will focus on journalists’ behavior in the aftermath of the April 2007 Virginia Tech shooting and will seek to find ideal ways for journalists to interact with their subjects during delicate, distressing situations.